We even found two bones that had a working ball and socket joint. Testing some dryer materials in the forest. So grateful for Hemlock and it's fine branchlets! caught a hungry chickadee who wasn't listening to the bird language in the forest! Fire-making and Bird Language! That’s what our Fox Walkers have been focusing on quite a bit over the past couple of weeks, as late-Winter transitions into Spring. While signs of Spring are popping up all around us (leafing-out Indian Plum, Hazelnut and Alder Catkins, and lots of territorial bird activity), these frosty and occasionally snow-filled days are a potent reminder that Winter is still very much here and may be sticking around for a bit longer than anticipated! Hence, getting a fire going in the morning has been crucial. Our fire-making focus has been specifically around the different sizes of fuel and how each size is essential to building a sustainable fire. Our Fire story introduced the “village” concept: it takes village of various sizes of wood to make your fire grow. In this village, the “baby” (aka coal) is cradled by the tinder bundle. Once the tinder bundle bursts into flame it feeds the “toddlers” (aka toothpick-sized sticks), who then feed the “kids” (aka chopstick-sized sticks) who then feed the “teenagers” (thumb-sized sticks) who then feed the “young adults” (two-finger-sized sticks), who then feed the “older adults” (wrist-sized wood), who then feed the “elders” (logs) of the village! Luckily, all of the wood batoning that we’ve been doing during the mornings has paid off, as we have a nice pile of various-sized fuel to feed our fires! Or a Fox Walker being a trickster? so cold and wet this was our second fire of the day! The Fox Walkers had the opportunity to apply this idea of a "fuel village" with a fire challenge. 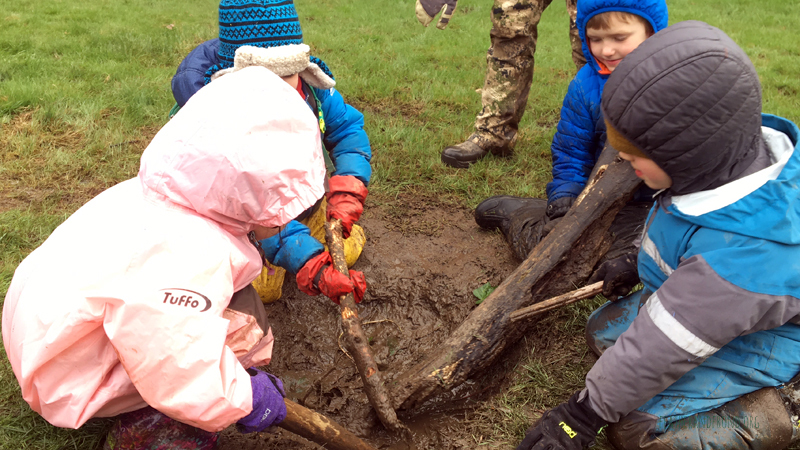 We presented them with an assortment of sticks in various sizes and challenged them to work together to arrange a fire structure that would burn for at least a few minutes. They did a wonderful job of choosing lots of toddler and kid-sized sticks to feed the teenagers and adults, and succeeded in getting a fire going! The Fox Walkers also helped make char cloth, which is an excellent fire-making material. Read more about char cloth in Pat’s recent Wild Wednesdays blog post HERE. For our Bird Language curriculum, the Fox Walkers were introduced to one of the five main voices of birds: Song. In our Bird song puppet show, Moon Bird learned the identifying features of an American Robin and then asked the Robin why he sings. Robin shared that he sings for a couple of different reasons: he’s happy and grateful to be alive and greet the sun, and he’s trying to impress a female Robin with his melodious voice so that she will mate with him. The Robin’s song sounds like “Cheer-ee-up, Cheer-ee-o”, and all of the Fox Walkers enjoyed singing along to his song! 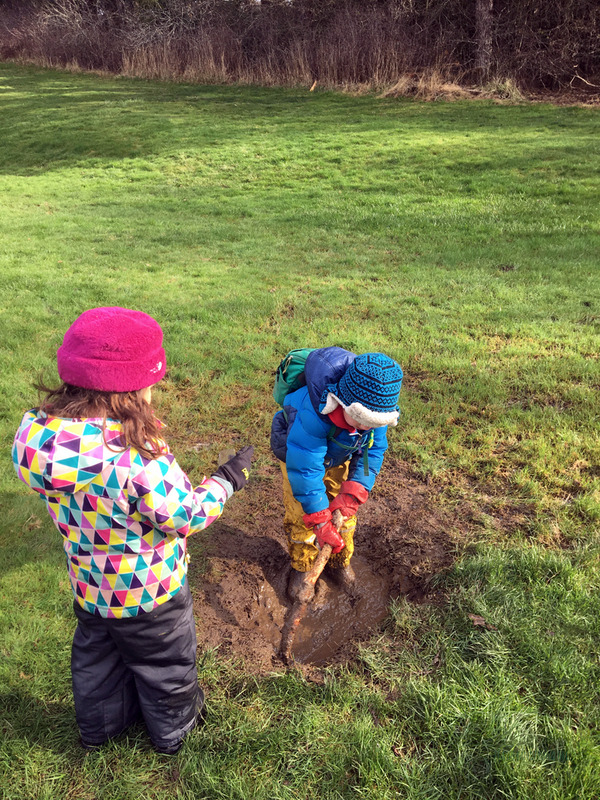 Some highlights from Fairhaven Park Fox Walkers: working on bow-drill, making “ice-cream soup” on a frosty day, Cedar Highway adventures, and playing Jays and Chickadees and Bird Tag. Some highlights from Whatcom Falls Fox Walkers: exploring a new-to-us part of the park where we observed a Dipper in the creek and some fresh Beaver sign, tracking in the snow, and roasting apples over the fire.